Zucchini and peas are pick-able in our gardens now. But otherwise, we're in the summer stall - waiting for the majority of our plants to ripen for the harvest. 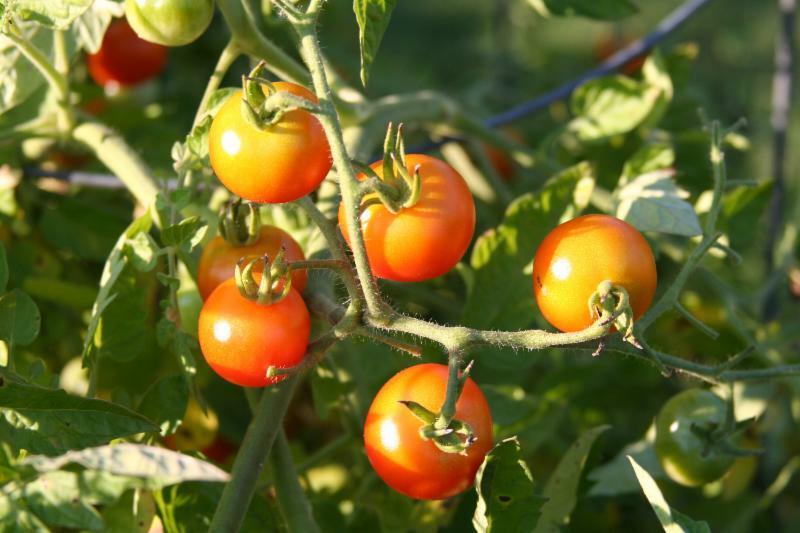 Besides watering and weeding, there are a few things we can be doing in our gardens, especially with tomatoes, to keep them healthy while we're waiting for the harvest to begin. Prune your tomato plants if they're getting wild and woolly. With proper pruning, you will not only neaten up the appearance of the garden, but fight off soil borne diseases, allow air to flow through the plants and spot insects more easily. If you water tomatoes overhead using a sprinkler, prune the lowest stems and leaves back to the main stem of the plant up so there is a clearance of about 1 ft. above the ground. Creating this distance between the plant and the soil keeps leaves from picking up soil-borne diseases from water splash-back during irrigation. If you use drip irrigation, prune leaves and stems at the bottom of the plant so that none of them directly touch the soil. With both methods, the result is the same. We're pruning to keep the tomato plant healthy by preventing soil-borne diseases from coming into direct contact with the plant. Prune to remove suckers to promote a healthier plant. Tomatoes have suckers. These are branches without flowers that won't produce fruit. They can be pruned to reduce the overall size of the plant. This pruning allows air to flow through the plant and you will be able to see insects more easily. As you remove suckers, follow the "Missouri Pruning" method. As you prune off the suckers, leave one stem above and one stem below each flower or fruit cluster. The stem above the fruit shades it and the stem below supplies sugar and carbohydrates for the ripening fruit. Scientists have verified that the fruited stem receives its nutrients from the stem below and that is why we need to leave that stem in place. Remove yellow leaves. Leaves at the bottom of the plant turn yellow because they are in the shade and do not receive the sunlight needed to stay green. Since they are not contributing to the health of the plant and are somewhat unsightly, they should be removed. Following these simple techniques will keep tomato plants healthy and help improve growth of the tomato crop you will soon be picking.